I also think that I'm going to leave the skulls out for the rest of the year. I love skullls. 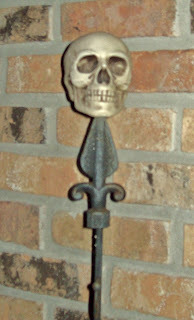 Especially skulls on stakes that flank the front door. So I hope that everyone had a great Halloween day. Now it's time to start planning for next year!